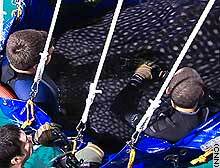 ATLANTA, Georgia (CNN) -- Officials at the Georgia Aquarium said Tuesday that it could take weeks to figure out why Ralph the whale shark suddenly died last week. Scientists from the aquarium, the University of Georgia and the Mote Marine Laboratory in Sarasota, Florida, conducted a necropsy, or animal autopsy, on the 22-foot fish Friday. Tissue samples from the shark are still being analyzed, and some samples were frozen for future research, aquarium officials said in a news release. After the necropsy, Ralph's one- ton remains were sent to a crematorium. The ashes will then go to an undisclosed animal cemetery, aquarium spokeswoman Ashley Manning said. Ralph stopped swimming Thursday afternoon and teams of divers and veterinarians worked for about eight hours to try to save him. The Georgia Aquarium is the only facility outside of Asia that holds whale sharks. It got them by negotiating with Taiwan, which catches the animals for food. Aquarium executive director Jeff Swanagan said the three surviving whale sharks --Norton, Alice and Trixie -- appear to be swimming normally but that the staff is watching them closely. The World Conservation Union lists the whale shark as a vulnerable species. Heavy fishing of the whale shark in several areas of Asia is believed to be one reason for its population decline. Ralph was the second popular animal to die at the aquarium in this month. On January 2, Gasper the beluga whale was euthanized. He had suffered from a string of chronic illness even before he came to the aquarium. Swanagan said the deaths were unrelated and that the animals lived in separate tanks with different water supplies. CNN writer David Williams contributed to this report. Ralph undergoes a physical examination at the Georgia Aquarium in November.